After “One” and “Butterfly 2”, M4, who is the codename behind “HTC One Mini”, is a coming new version of HTC. Maybe the developers thought it would be a good idea to stop decline by new products. Judging from the revealed pictures, the handset is supposed to be a mini version of the 4.7" HTC One (M7). And the appearance is metal too. Being different from One, HTC's new phone appears to be its middle-weight offering, but it's still looking to impress with a 4.3-inch 720p inch Super AMOLED display and a new dual-core 1.2GHz Qualcomm Snapdragon S3 S4 (MSM8260A) inside set to do the heavy-lifting, 16GB of internal storage, 1700 mAh battery and an UltraPixel camera. It said that M4 may be shown in June this year. As one of the most competitive brands in mobile phone, HTC has been becoming popular in the global markets. We often encounter the problem of how to edit the HTC video when we got some videos recorded by HTC phones. And we may also need to edit and convert videos into suitable formats to enjoy and share them on our HTC phones. 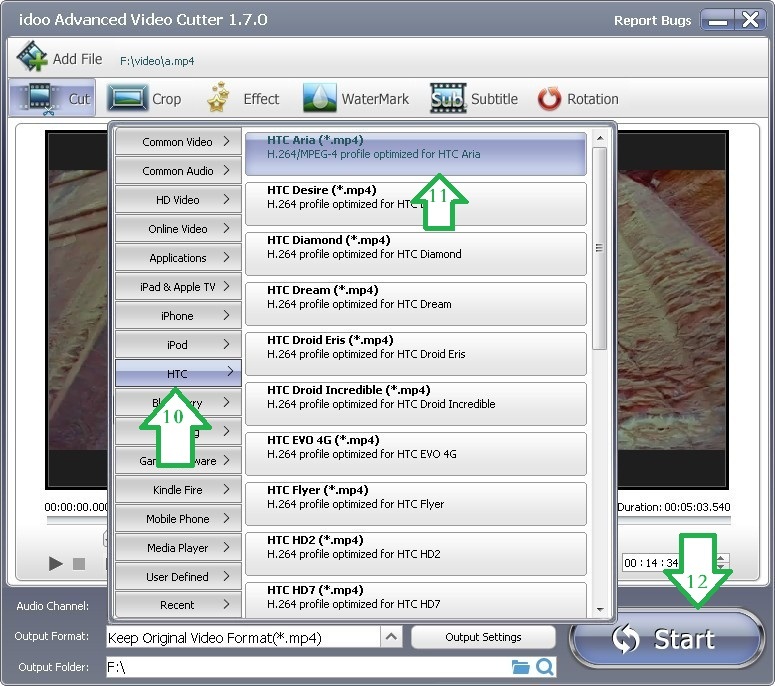 What we are calling for is an easy-to-use and excellent video editing tool, as well as an HTC video converter. 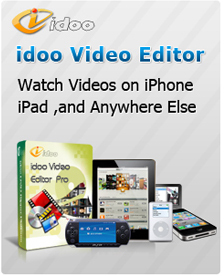 idoo Video Editor just meets all your needs. 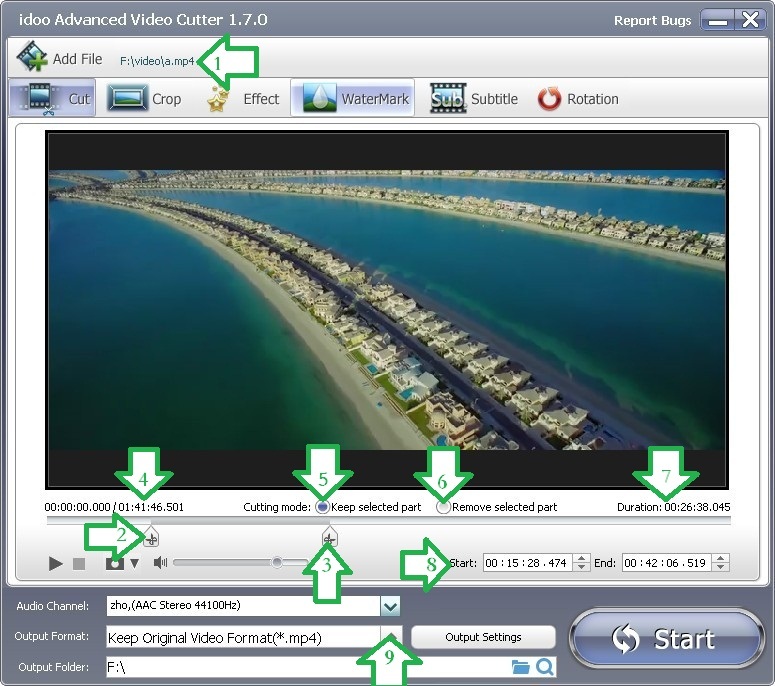 Its powerful editing and format converting functions enable you to cut and convert your videos into the exact files you need, including HTC video format. The following part will illustrate how to cut and convert the format of a video into HTC video format by idoo Video Editor. 1. 1. Click “Add File” (Arrow1) to select the file to edit. 2. 2. By adjusting the time sliders (Arrow2&3) to select the start and end of the part you want. The length and current time are showed below the screen (Arrow4). 3. 3. Determine the cutting mode: to keep the selected part (Arrow5) or to remove the selected part (Arrow6). 4. 4. The “Duration” (Arrow7) shows the length of the cut part. 5. 5. The start and end time can be also adjusted by putting in the exact time in the boxes (Arrow8). 6. 6. Click the drag-down list of “Output Format” (Arrow9). 7. You may select your target video format, “HTC Aria” (Arrow11) from “HTC” (Arrow10) file types.